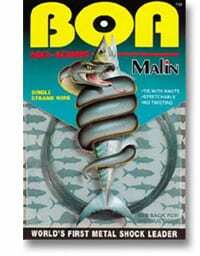 Malin’s revolutionary “BOA” No-Kink Titanium shock leader wire is the best choice for all fishing applications requiring a leader, whether it be live or dead bait, conventional lures or fly. “BOA” No-Kink is available in sizes 10 lb/.004 diameter through 60 lb/.016 diameter. Try a coil today and increase the odds of releasing, boating or landing that prized catch. A corrosion proof titanium leader for maximum abrasion resistance. A titanium leader with a stretch value of 10% to 15% for increased hook setting ability, and protection against excessive shock. A titanium leader that will rival fluorocarbon for invisibility in water because of its natural color and non-glare finish, and it stands up to toothy fishes, fluorocarbon does not. A titanium leader that is highly flexible and is virtually impossible to kink in a fishing application. It cannot be haywire twisted and does not need to be crimped. A titanium leader than can be tied using the listed conventional knots. Just pull the knots down snug using pliers, until you feel the stretch, and trim tag end. The knot will appear to be loose and will not pack down like a mono knot, but don’t worry, they will hold.